I’m always amazed and pleasantly surprised to hear stories from today’s leaders in the venture capital and private equity business testifying to the continuing legacy of Georges Doriot. Case in point: This week I spoke to the co-founder and senior managing director of HarbourVest Partners, D. Brooks Zug. HarbourVest is one of the world’s largest fund of funds investors, with more than $30 billion of capital invested in various partnerships over the years. The Boston-based company began as an affiliate of John Hancock Mutual Life Insurance Co. in the late 1970s. In 1982, the firm created its first fund with $148 million of capital to invest in U.S. private equity partnerships and operating companies. Zug, who told me had dinner with Doriot soon before he died in 1987, said the General and the venture firm he ran for 25 years, American Research and Development, played a key role in convincing John Hancock to support the creation of HarbourVest–thereby helping to spawn the fund of funds world. The reason? John Hancock was one of the founding investors in ARD–the first venture capital firm to raise money from non-family sources such as pension funds, endowments and insurance companies. In fact, ARD worked out of the old John Hancock building for most of its existence. Although most investors thought John Hancock and the handful of firms that backed ARD’s first $3.5 million venture fund were nuts, Doriot and ARD proved them wrong. John Hancock earned a 10,000% return on its investment in ARD, said Zug. “The firm’s support of ARD helped management be receptive to the idea” of backing HarbourVest, said Zug. Today, institutional investors contribute the majority of capital to the private equity business, and the fund of funds world has become a major player in global capital markets. 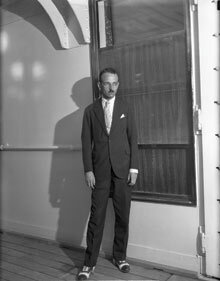 And for that, we can thank Georges Doriot. 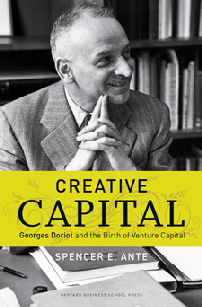 MIT Technology Review published a long and nice review of Creative Capital in its July/August issue, along with a cool black & white photo of Doriot from 1931 standing on the deck of the luxury liner Ile de France. The review was written by contributing editor Mark Williams. I am stoked since MIT played such a crucial role in the founding of Doriot’s VC firm, American Research & Development. Enjoy!